hearthstone's newest expansion, Whispers of the Old Gods, is being released in less than a week. 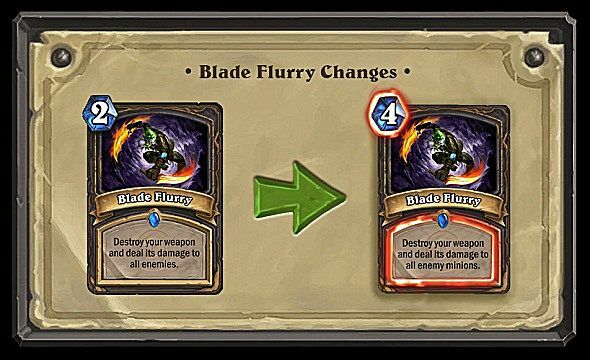 Following this news, Blizzard also released information regarding changes to cards that have been in the game since its initial release. These "basic" card types are rarely changed, and when they have been in the past, it is typically a hotly debated topic among forum users and the respected streamers in the community. In order to help players understand why these changes have happened, let's take a look at each of them in an objective manner to better understand why they're being changed at all. 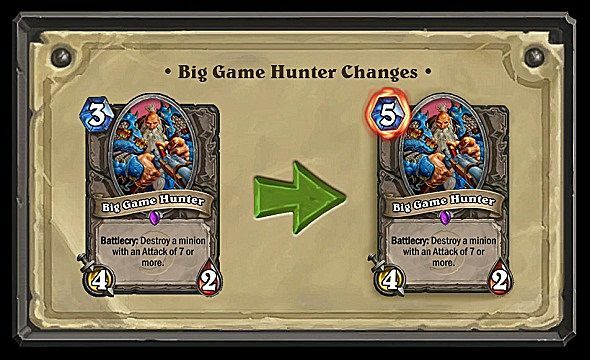 It's important to note that every one of these changes have been made with the intention of lowering their overall power in the game, so we are not trying to claim these changes are better for the card individually. Instead, we'll discuss how they affect the game's development and the card's associated class. We'll start with the Druid class, which is known among the hearthstone community as a rather stale choice. While it has always been dependable, most of the cards that make up its most popular deck choices have been in the game since its release. As such, quite a number of their classes have been tweaked down, or otherwise changed to encourage players to expand their options. The first Druid card we'll discuss is the Ancient of Lore. The Druid class has a theme of flexibility, and as such this card has the option of giving the player the choice of drawing two cards or restoring five health. Most of the time in competitive play, the draw option has almost always been the preferred choice, since five health is normally not a huge table turner, but two cards can be, especially if you're already ahead of your opponent. The changes reduce the card draw down to one card. This brings the card's effect in line so that one option isn't necessarily far more appealing then the other. 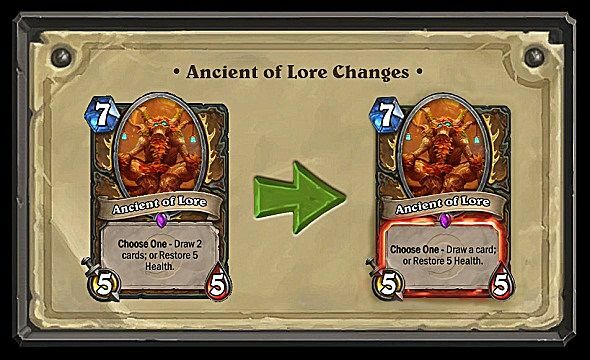 Ancient of Lore has long felt like a must-have in Druid decks, and it seems the developers would like to encourage players to feel like they have other available options. 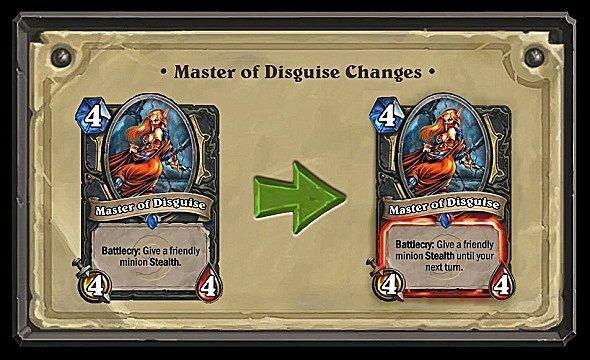 This card has seen the biggest change of all of the revamps, since this card's entire purpose has been changed. Now you gain three minions for a five mana cost card. Many players feel this card has been reduced to a point where it is unplayable, due to the still relatively high cost of the card. 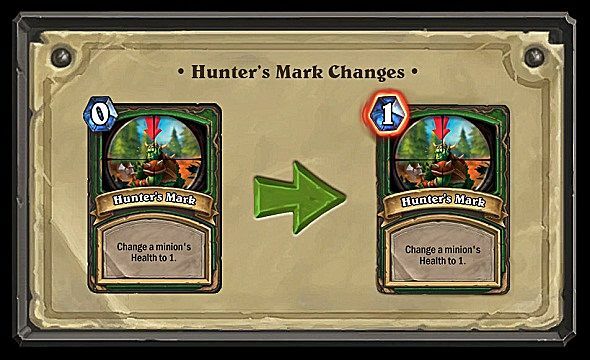 Whether or not that is true, it is nice to see that Druids are being encouraged to move away from a singular deck style, while still keeping a way to add more minions to the board to set up a similar Savage Roar-styled win. The last of the Druid class cards on this list, Keeper of the Grove, also falls under the category of Druid cards that were too good to pass up. 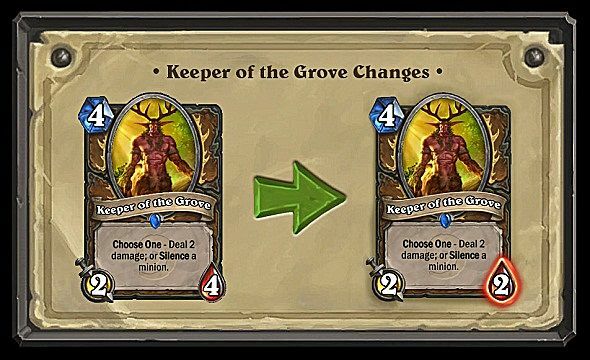 Once again giving the player the choice between card effects, Keeper of the Grove has always shined as one of the few cards in the game that has the powerful Silence effect. This ability removes any card text from your target, including any buffs or other attributes. Since there are so few cards with silence effects, Druid's access to Keeper of the Grove has always been a must-have, especially with its well-balanced stats. The change lowers the overall effectiveness of the card as a body on the board, while still maintaining its powerful Battlecry. As recently mentioned, Silence can be very powerful. Since Ironbeak Owl has always been the lowest cost silence card in the game, and is available among all the classes, it has typically been the go-to choice when deciding to run a silence in your deck. The changes made to this card are also due to just how powerful the Battlecry is. Being able to outright remove an opponent's strong creature can be a very powerful swing in the game's momentum. As such, not many players are too surprised at this change. It's also fairly easy to see why this card would be tweaked from a developer's standpoint. Many cards are devalued when they have a high cost but an attack over seven damage, due to how simply this card could remove the threat. The increase in cost should make players think more about what they expect to face off against before adding it into any decks. This change is simply due to the card's high efficiency. Most other cards in the game that have a definitive outcome also typically have a definitive cost. This is simply an update to meet those requirements. Perhaps the most hotly debated of changes, this is the only card in the lineup that suffers two negative outcomes. 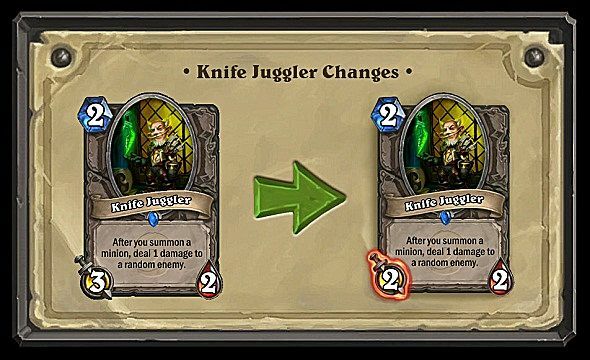 This change particularly stings players, since the Rogue class that this card is available to has the lowest win rate among all the classes in competitive play. These changes seem more focused on the overall health of the game's development going forward. The developers specifically mention how this card can grant quite a large advantage for rogues, since it deals both high burst damage and can clear an enemy's board. Now the player is meant to have to make the decision between dealing more damage to the enemy hero or clearing their board with their weapon. If you have played hearthstone at all, you're probably familiar with this little guy. Due to his low cost and common availability, the Leper Gnome has always seen his place into decks that favor the fast kill. 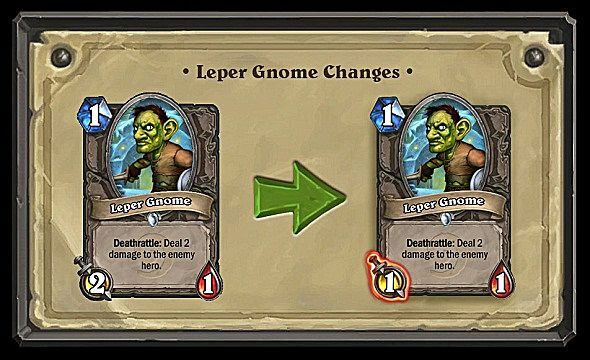 The changes to Leper Gnome have been made with the intentions of making him just a bit less threatening to bring him in line with his cost, as well as broaden the scope of 1-drop minions players see in the game. Another attractive choice to players choosing to burn down their opponents quickly, the Arcane Golem has found his way into some pretty interesting combos over the years. 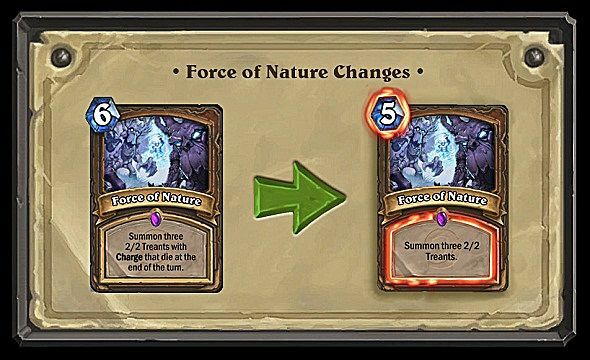 This change comes from the same ideology that affects Force of Nature, in that there's often not much a player can do other then hope their opponent doesn't draw this with the right combination of other cards. The change makes this card into a cheap minion with solid stats, and a Battlecry that is similar in style to the card Dancing Swords. 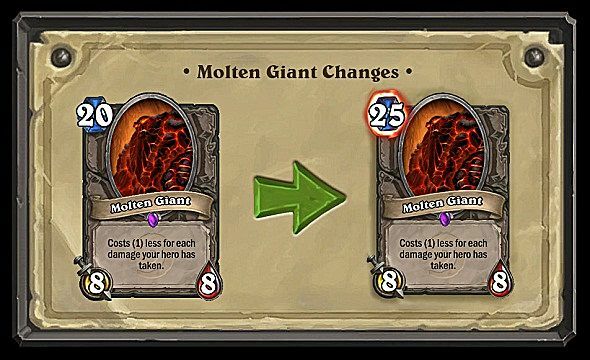 Molten Giant's change comes in lieu of a few other changes that are occurring. 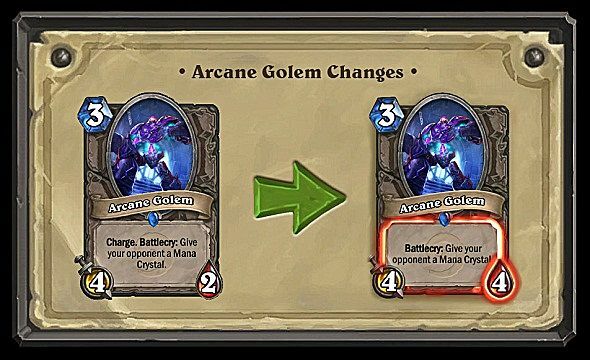 First off, with the reduction of burst damage due to Force of Nature and Arcane Golem being altered, having a lower health pool to reduce the Molten Giant's cost to zero won't be as dangerous against some classes as it used to be. Unlike most of the other changes to cards which have all been reactive, this update was meant as a proactive approach to being able to add more types of cards into the game. This makes a lot of sense, since any card that would limit the options Blizzard can add would only take away from the game. That's all for the announced changes so far for the "Year of the Kraken" season of hearthstone. If one of your favorite cards or play styles got nerfed, remember that we still have another 134 cards coming out in just a few days for you to play with. Any thoughts of these changes? Let us know in the comments!